I’m a few weeks into a side project that I blogged about in a previous post. I’m having a lot of fun (I’m such a geek) using a bunch of new stuff. Since Visual Studio 11 is at the center of all the work on the project, I thought I’d share my first impressions on it. Of course, I’m using a Beta version of it. Really this post is about my second thoughts since they are much more meaningful. Spoiler alert: First impressions aren’t always the most important. That is pretty much what most people think when they see it for the first time. People tend to ignore all of the improvements and new features and focus on the lack of color. At first I found this lack of color to be somewhat distracting which is odd because it is meant to have the opposite effect. I’ll be honest, I wasn’t thrilled with the new look but I was quick to point out to some of my peers that we should give it some time and get used to it. Guess what? I got used to it… quickly. 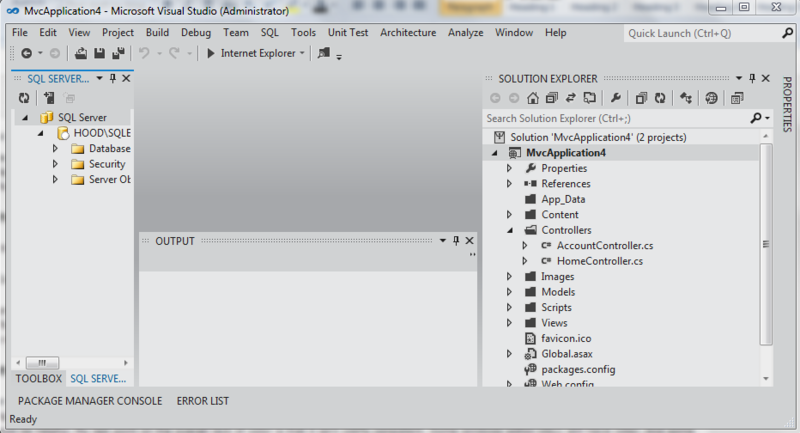 After using Visual Studio 11 for a couple of hours, I quickly got used to the lack of color. It isn’t really that big a deal and I think the VS team was on the right track by moving Visual Studio overall to the background and making the code editor the focal point. Having said that, I still think some color would be helpful. My last point on the overall lack of color is that it isn’t 100% consistent. Some windows within VS11 still have color. And some plugins use color too. That makes things a bit odd. I’m including a screenshot below. That’s all for the color. I like the fact that the great features of the Solution Navigator (previously part of the Productivity Power Tools) were combined into the Solution Explorer. Of course, the Add Reference dialog is a huge improvement from the past, that was also a feature from the Power Tools. I’m also a huge fan in the reduction of items in the toolbars. I think the VS team really nailed that part of the design as well. They took out all but the most commonly used buttons from the toolbar – but only in the default configuration. If there is a button or toolbar you like, just add it back in. That part is easy! More importantly, we should all get used to the Quick Launch feature. With that, we can just type the name of any command we want. No more hunting around in the menus for seldom used actions! Another great feature is the Preview Tab. I’m surprised more people aren’t talking about this one. This is pretty cool but I don’t think you can get the full value of it until you experience it yourself. Think about all those times you are debugging and you end up stepping into file after file after file. All those files get opened up in the tab well. Eventually you get to the file you want in the debug process. But when you are done you have a ton of open files. Not everyone is like me, but I hate open files. I want my tab well to be as empty as possible. Preview Tab to the rescue! With VS11, all of those files that you step through don’t open up as normal files, they open in the Preview Tab. But Preview Tab only has one file at a time. So each new file you step into replaces the old one and your environment stays clutter free. And Preview Tab is pretty smart too. If you make a change to the file it moves it into the normal tab well. You can also click a button in the tab to “promote” the file to be a normally opened file. In this image you can see the Preview Tab on the right, circled in blue. While it isn’t really new, I want to mention that the extensibility features of VS11 (and 2010 too) are really powerful and work so well and somewhat seamlessly. The Extension Manager is really cool and with it I’m always adding tools to Visual Studio. There are loads of great things to install. 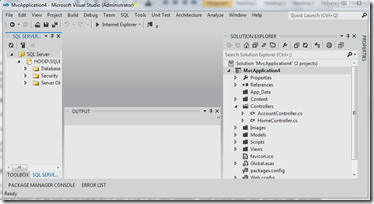 With VS2010 I hadn’t gotten to experience Nuget but with the work I’m doing now in VS11 I am all over it. Nuget (or is it NuGet, or nuget?) is providing all kinds of good stuff for my solution. Between VS11, the extensions and nuget packages, I really feel empowered to create great solutions. There are lots of other great features, these are just the ones that came to mind as I was writing. Download the Beta and check it out for yourself! Posted in .Net, asp.net mvc, C#, Visual Studio. Want to Learn Some New Skills? Just Write It! A lot of new stuff has been coming out from Microsoft lately. 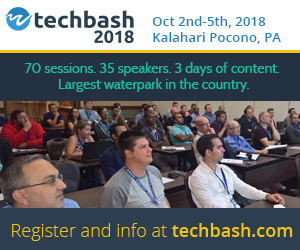 Couple that with all the cool open source projects available for use and a developer can quickly get left behind from all the new technology. I try to stay pretty current but there is some new stuff that I’ve been wanting to use. I also wanted to brush up on some old skills and even use some of the technologies I am experienced with in new ways. I decided it was time to start a little project for myself. I’m often asked by developers about how they can gain experience with new technology (or even old tech that is new to them). My advice is that they should just write an application that uses the technology. As a hiring manager, I’ll give serious consideration to that kind of experience, provided it isn’t “hello world”. When I write an application like this, I treat it like a real world production project. And if you are creating a web application you can have it hosted and then it IS a real product. That should count as experience to a smart hiring manager. So when you write these applications, try to follow all of the best practices, use good standards, etc. In my case, I am writing an application that I hope will actually get some use. I’m hoping to get some great blogging material out of this as well. I already have, but now I need to find time to write about it. Anyway, figure out what you want to build and then create a list of the things you want to learn. As you write the application, you can just keep adding other technologies, frameworks or patterns in along the way. Here is my list of things I’m using or will be using in my new pet project. Obviously the beta stuff is brand new. And I’ve already got experience with MVC 2 (pre-Razor), jQuery, HTML, CSS, etc. However, this stuff gets better and better all the time and I like to stay on top of it. Working a few hours here and there for the past 2 weeks, I’ve already included all of the items in blue in my project. Of course, Dependency Injection, Unit Testing, and all of the other stuff I put into any app I am deploying. The Countries DropDown is pre-populated with data passed in ViewData. The second DropDown, Regions gets loaded when Countries changes. The last thing to do is load all of the results into the Select List. This actually was the hardest thing to do but in the end it is very little code. I tried using jQuery to create options and adding them to the select list. I tried creating a list of options and setting the html value of the Select list. I tried a bunch of stuff. But this worked great… Iterate over the results with jQuery’s .each function and call a function for each iteration. The function creates some dynamic html and appends it to the Region list. I must admit, I was surprised this worked. I’d assume that appending would put it after the select list (<select id=”Regions” />) but it actually put it inside it! That’s it! It works great. Of course there are more complex ways to do this, with caching etc. This is just one way to accomplish the goal. Here’s some code from the Controller that helps make it work. Just remember, this is demo code. I’m not too worried about separation of concerns and similar details. In a production app, I’d be calling more services! In the Index Action (in this sample the Select Lists are in my Index View) I load the countries list into ViewData. Again, this is a demo and that may not be the best practice. That covers most of it. Happy coding. Posted in .Net, asp.net mvc, jquery. When using strongly typed views, don’t name the controller action arguments with the same name as another form value! I’ve been working with ASP.NET MVC for a couple of months now. It is really pretty awesome. It’s worked so well, I haven’t had much to blog about! The other day I ran into an issue so I’m sharing the solution. MVC will “automagically” bind the parameters of a controller action based on the values in the form. And if your View is strongly typed and your controller action has a parameter of that same type, it will bind it too. But in my case, the parameter was null. MVC wasn’t loading it. And there was no exception to help me out. In the screenshot below, you can see that when I debug the app, the role parameter has not been loaded. You see, I was being lazy and abbreviated the argument’s name. That is ok, you can name the parameter almost anything you want. But I gave the parameter the same name as one of the other form variables! Notice above that my form has a text box named “Role”! MVC tried to load the values of my parameters – it takes each of the posted values from the form (“OrganizationName” and “Role”) and tries to match them up with arguments with the same names (it is not case sensitive) if they exist. It also tries to load the entire form value (strongly typed as the class OrganizationRole) to the argument of type OrganizationRole, if one exists. But an argument of type OrganizationRole with the name “Role” screws the who thing up! The only problem is that it doesn’t throw any exceptions. Anyway, I changed the name and presto, it works. Posted in .Net, asp.net mvc.